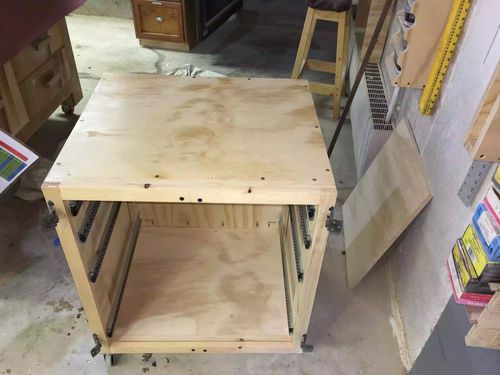 In case you haven’t noticed I have been working on my workshop to-do list for a while and next on my list was a Table saw Accessories cart, something that I can place directly under the right side of my table saw so as that I didn’t have to keep walking out of my way every time I needed to use an accessory for the saw, ie Dado stack, push stick or a million other tools I use with this machine. 7. 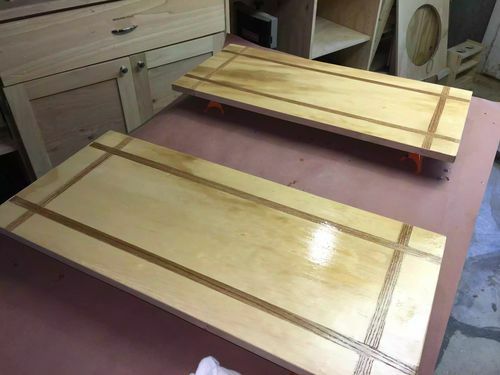 Last but not least I put 3 coats of Polycrylic and sanded with 220 grit between each coat and it came out great, I am glad this came out ok because I was getting to the point to spending all this money building projects only for the finish to come out subpar.. I think the overall cost of the project was around $150 but its worth every penny. Anyway I didn’t intend on the project post to be this long, but there you have it. 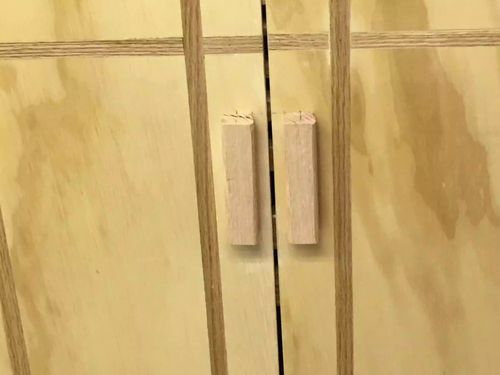 I am going to be taking a break for a little while why I navigate setting up my own website with GoDaddy.. its another woodworking project but 100% on the computer. Great Job. Looks awesome. 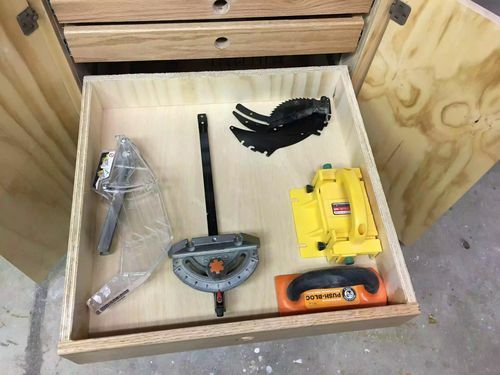 I’m using a Husky drawer tool cabinet instead in that place but now I might make a new one :) Did you think about leaving out the doors? Your getting organized Ed! The cabinet looks great now your shoes will last longer! LOL!!! Nice work! 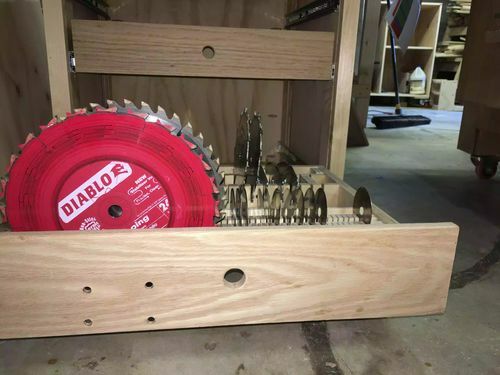 Nice RIDGID table saw hey let me say….. OH never mind! NICE work but I would have gone with just drawers NO DOORS seems to be one extra step to get to your stuff. I bet we both get our 100 pound full extension drawer slides form the same place… E-BAY! Very nice work. You will love having it, and be proud to show it off. 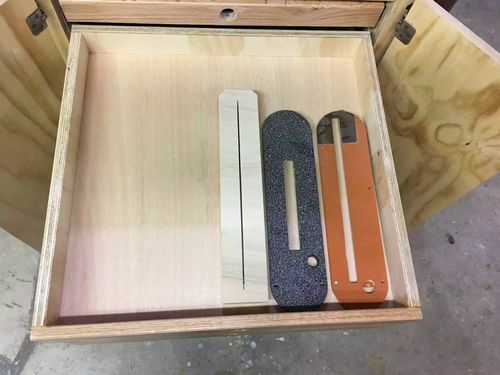 What are those discs – not blades – in blade drawer rack? I count 7 of them. I’d guess from the photo they are about 4, or so, inches in diameter. I cannot think of what they might be. Thank you for showing this on the LJ forums. I count 7 of them. I d guess from the photo they are about 4, or so, inches in diameter. Great Job. Looks awesome. 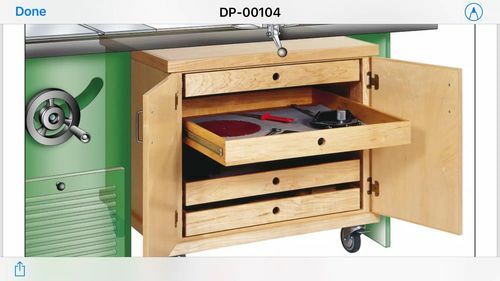 I m using a Husky drawer tool cabinet instead in that place but now I might make a new one :) Did you think about leaving out the doors? 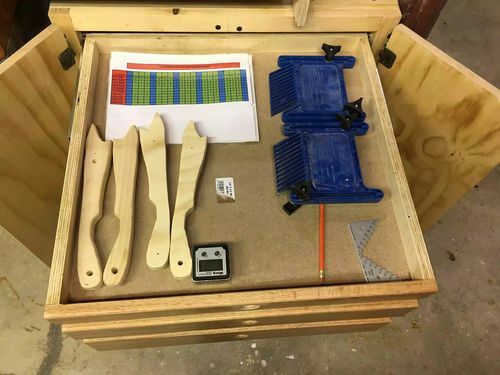 Nice work, have one with all drawers and can say it has helped greatly over the years.